How does the scanner trigger my stimulus program? When the scanner starts acquiring data the stimulus computer will receive the same signal as if the “5” has been pressed in the top number row of the computer keyboard, as illustrated in the picture (NOT the “5” in the numeric keypad, that is a different signal). Pressing the “5” in the top number row on any computer is IDENTICAL to the trigger signal received from the scanner by the stimulus computer, therefore for trigger testing purposes it is not necessary to connect to the scanner set-up. 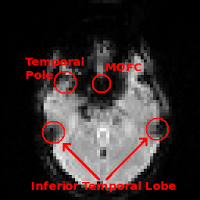 What is the slice acquisition order for functional scans? Slices are acquired in an interleaved fashion from inferior to superior (i.e. bottom of the head to the top) assuming you have an axial or oblique axial acquisition (which is usually the case). If you have an odd number of slices, the lowest slice will be the first to be acquired (i.e. slice 1), whereas if you have an even number of slices, the second to lowest slice will be first (i.e. slice 2). For example, if you acquire 7 slices the order of slice acquisition would be [1 3 5 7 2 4 6], whereas if you acquire 8 slices it would be [2 4 6 8 1 3 5 7]. How long should my functional scan be? The length of a functional scan is entirely dependent on the length of your paradigm. This being said, when developing the structure of your scan session/paradigm, it should be kept in mind that it is generally better to have a greater number of shorter scans than a smaller number of longer scans. 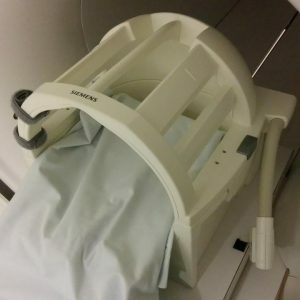 This is mainly for two reasons: 1) longer scans are more prone to subject fatigue, and 2) in the event of a technical malfunction in the middle of a scan, less data will be lost when using shorter scans. Typical lengths for functional scans range from 6-10 minutes. Triggers are actually sent at the beginning of each frame (i.e. every TR), though it is most often only the trigger of the first recorded frame that is of interest for synchronization. How many frames should I ignore in BOLD imaging? With a TR of 2s, the standard BOLD sequence ignores the first two frames of every scan (i.e. these frames are not recorded; these are called “dummy scans” this value depends on the TR, so if you have a different TR please inquire further with Jacob), meaning the first trigger is actually sent at the beginning of the third frame, which is the first frame whose data is actually recorded. This should suffice, and therefore no extra frames need be ignored, however, if it is of concern, ignoring another 2 frames would be more than enough (though this would have to be appropriately taken into account in the corresponding stimulus program). The exception to this rule is Multi-Band EPI Data. For very low TRs (<500ms) steady state is not reached after the built in dummy scans. Programming your stimulus and analysis to skip the first ~10 frames is likely important. This may change in the future if we gain the ability to alter the number of built in dummy scans. What are the differences between the 12 channel and the 32 channel head coils? In general, the 32 channel head coil provides better SNR than the 12 channel head coil. This is particularly true for anatomical scans, however, for functional scans it is not the case for all regions within the brain. For example, the 12 channel has been shown to record stronger functional activation in subcortical regions, while the 32 channel was advantageous in detecting activity in the visual cortex (Kaza, E. et al. 2011). Voxel resolution is another point to consider; at a voxel resolution of 3mm, there may be minimal benefit in using the 32- over 12-channel coil, while at 2mm the benefit becomes more apparent (ISMRM 17th Annual Meeting, 2009, Abstract #1614). In fact, due to a greater receive field heterogeneity, scans may be more sensitive to motion with the 32-channel coil. In addition, the 32 channel coil is physically smaller (226mm A-P, 196mm L-R; note these measurements do not include padding, which will take up a few mm in each direction) than the 12 channel and will not accommodate larger sized heads, something to consider if scanning a population where this may be an issue. It should also be noted that EEG cannot work with the 32 channel coil simply because the physical set-up is not possible. What is the resolution, aspect ratio, and visual angle of the projector in the scanner? The native resolution of the projector is 1024×768 (an aspect ratio of 4:3). The native resolution of the monitor attached to the stimulus computer is 1280×1024 (an aspect ratio of 5:4). By default the projector displays an interpolated image at a resolution of 1280×1024 (an aspect ratio of 5:4). We can have the projector display a native image at a resolution of 1020×768 (an aspect ratio of 4:3) upon request. You can chose your preference of resolution (interpolated up to 1600×900) from your own stimulus laptop. The viewing distance from eye to screen is ~132 cm. With an aspect ratio of 5:4 the screen size is 34.7 cm (horizontal) x 28.2 cm (vertical). This is a slightly cropped image. Yielding visual angles of 14.98 (horizontal) and 12.19 (vertical) from edge to edge. With an aspect ratio of 4:3 the screen size is 37.4 cm (horizontal) x 28.2 cm (vertical).This is a maximized image. Yielding visual angles of 16.13 (horizontal) and 12.19 (vertical) from edge to edge. If the visual angle of particular images you’re displaying is of critical importance to your experiment, contact Jacob Matthews after your experiment is programmed but before you begin your pilots to arrange a time to confirm the correct display of your stimuli. What is iPAT? What are its advantages/disadvantages? 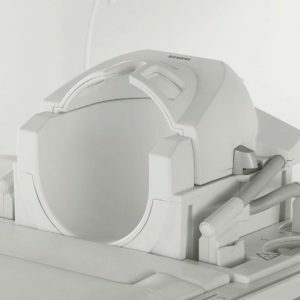 iPAT (integrated Parallel Acquisition Technique) is the Siemens implementation of parallel imaging. 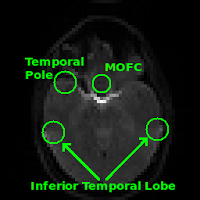 Parallel imaging exploits the multiple channels of the head coil and their different spatial sensitivities to allow for the acquisition of a reduced data set while maintaining image quality. This reduction in acquired data can then allow for faster, higher resolution, or larger coverage scans. However, the use of parallel imaging results in a reduction in SNR, can result in an increased sensitivity to motion, and if used too strongly can result in artifacts. As such, the use of iPAT for functional scans should generally only be considered when one needs to push either spatial resolution below the typical value of ~3 mm, or make the TR much shorter than 2 s, both while maintaining whole brain coverage. What regions are typically affected by susceptibility effects in gradient echo BOLD? 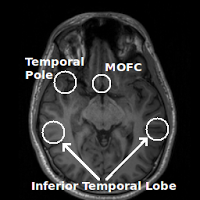 Regions commonly affected by susceptibility artifacts in gradient-echo BOLD include the medial orbitofrontal cortex (MOFC), temporal poles, and inferior temporal lobe. If your interest is particularly in one of these areas you may consider running a spin-echo BOLD scan, instead of gradient-echo, as it is unaffected by susceptibility effects. How do I use/interpet the physiological (physio) recordings? The easiest way to use the physio recordings (.ext, .puls, .resp) are to first process them using the prepphysio script that exists on most Rotman servers. prepphysio will “Preprocess Siemens physiological data dump files and convert them into a simpler format usable by AFNI and pretty much any other software.” For more information on how to use the script, just run the prepphysio command without any arguments on one of the servers and it will output instructions on how to use it. Read in the first row of the file and ignore/remove: a) the header information (orange above), and b) Any instances of 5000 (red above) or higher (e.g. 5003). You should then be left with the raw physio recording. The start and end times of a given physio recording are given, in msec from midnight (i.e. 0 would refer to 12AM), by LogStartMDHTime and LogStopMDHTime respectively. The start time of a given fMRI run can be found in the header information of that run’s first DICOM (if you don’t have a way to see DICOM header information, try ImageJ; when you open a DICOM ImageJ, click Image -> Show Info…). In the header, it will be found under the heading “0008,0032 Acquisition Time:” and will be in a 24h clock format (e.g. 165445.652500 = 16h 54m 45.6525s); you may want to convert it to msec from midnight. Using the two start times, find the point in the raw physio recording (from step 1) at which the run starts (Note: The physiological recordings are sampled at 50Hz, i.e. each sample is 0.02s after the previous). You can calculate the number of physio samples to include from this sync point on by using the TR and number of frames in your fMRI run (e.g. if your TR = 2s and you have 192 frames, then you will need to take a total of TR*number of frames/physio sample period = 2*192/0.02 = 19200 samples). Write the synced time course of physio samples into another file. If you want the file to be in the same format as output by prepphysio make sure that you save them into a text file with one value per line and save the text file with a .1D extension (i.e. run1.puls.1D, run1.resp.1D). NOTE: The default output of prepphysio for the .puls.1D file is to contain a time course that does not contain the raw pulse signal, but rather one that indicates the peak point of each pulse beat with a ‘5’, and ‘0’ everywhere else. If you are attempting to recreate the default output of prepphysio you will have to take this into account (i.e. you will have to find the peak points for the pulse time course, either manually or with a peak detector (e.g. in MATALB)). For further questions please contact Jacob Matthews.